Mediterranean Ecology (in English): This class is awesome, especially since we get to go on the best field trips. During class and lectures we talk about what abiotic (non-living) conditions make the mediterranean area unique and how plants and animals have adjusted to cope with those conditions. During the field trips, we examine the plants, animals, and geological structures we learned about in class. For example, we got to see Spanish Badlands! And one of the driest places in all of Europe, called Cabo de Gato. 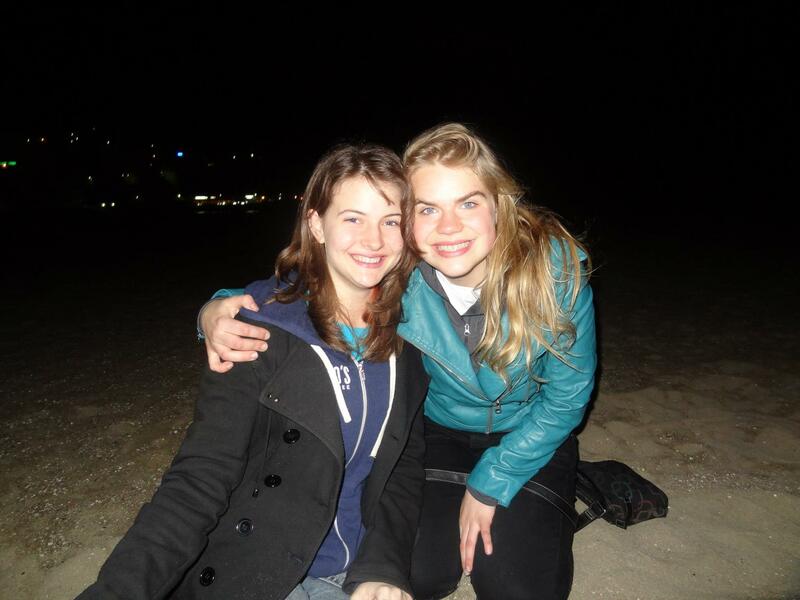 A fellow Hope student Lexi and I on the beach during the overnight trip. 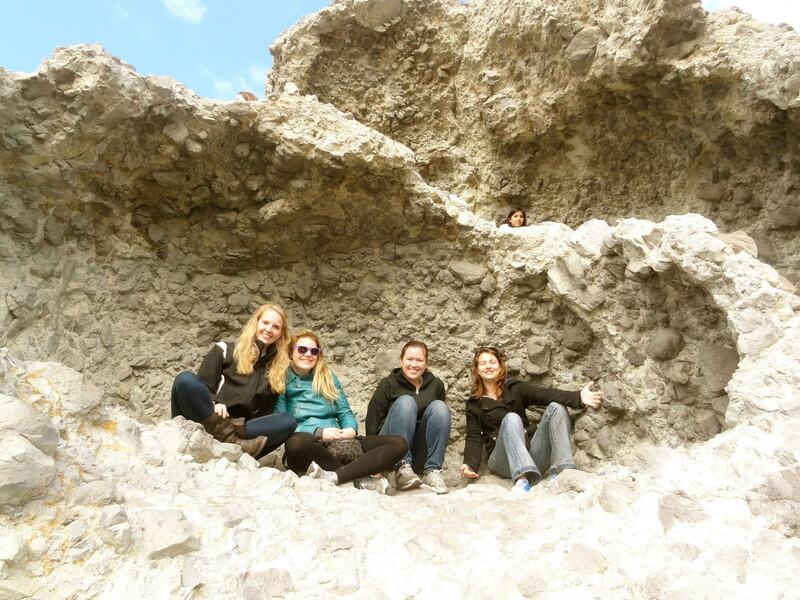 A bunch of fellow ecologists in a volcanic rock formation! Islamic Civilization before 1492 (in Spanish): Most Americans know the date 1492 as the date “Columbus sailed the ocean blue” from our nursery rhymes. However, that is also a very important date in Spanish history because that was the year the last of the Muslims were pushed out of Southern Spain or Al-Andalus (where Andalusia gets its name). This class is a quite comprensive cover of Islamic history, with special emphasis on its effects on Andalusia. Our professor also leaves open time to discuss current events that relate to the class which is very enlightening as well. So far I am loving the classes I am taking here, so I thought I would share a short summary of what I am taking and why I love them in. This will be in two parts, because apparently I love them more than one post can contain. Spanish Class (in Spanish): Before coming to Spain, the most recent class I had taken was AP Spanish senior year of high school, so I was quite nervous about learning the language and being able to get by. 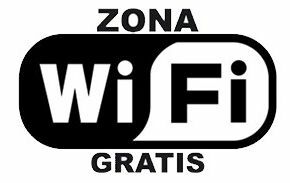 However, I am now taking a class at the University of Granada with all Spanish speakers and getting by so I think it has improved quite a bit. In class, we mostly review grammer that I have already learned and do fun activities. The worst part of the class is by far having to wake up for it! Islamic Art and Architecture (in English): This class is by far my favorite because I feel like it combines everything I have learned in my life so far: history, math, physics, philosophy, artistic design, religion and a little bit of politics. Because in Islam it is prohibited to display figures in public places, they developed very complex geometric designs. These designs aren´t just beautiful, they also represent their worldview and philosophical ideas, just using shapes and colors! The easiest one to describe (but still quite difficult) is the representation of God radiating through everything and everything starting from him. For both the patterns below (roof on the left, tiles on the right), a pattern with a variable of 8 begins with some design of star in the middle. Especially for the tile pattern, the visual understanding or continued expansion of the pattern could not be continued without starting from the center. It is also a very unifying idea because most believers in monotheistic religions, if not most spiritual people, would agree with this idea. These patterns are also echoed everywhere throughout the buildings, from floors to ceilings to doors! 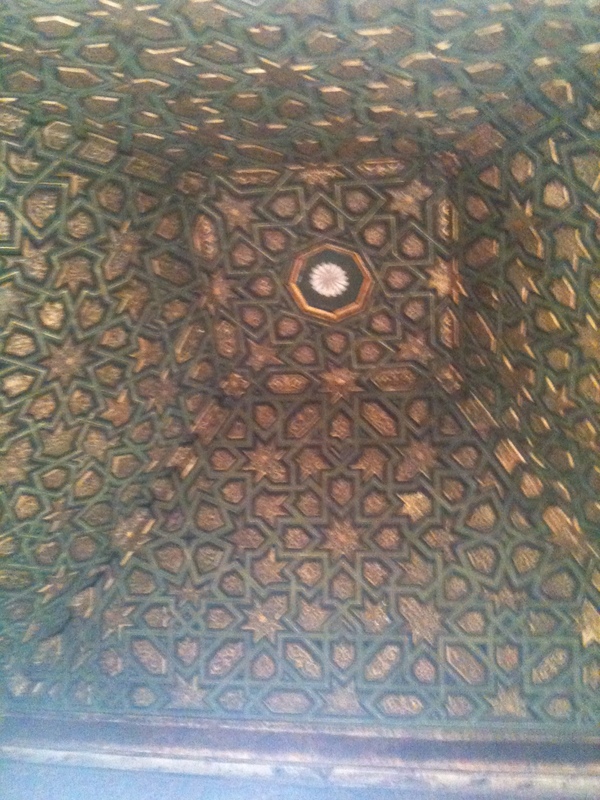 Ceiling woodwork in a private section of the Alhambra that they opened specifically for our class! 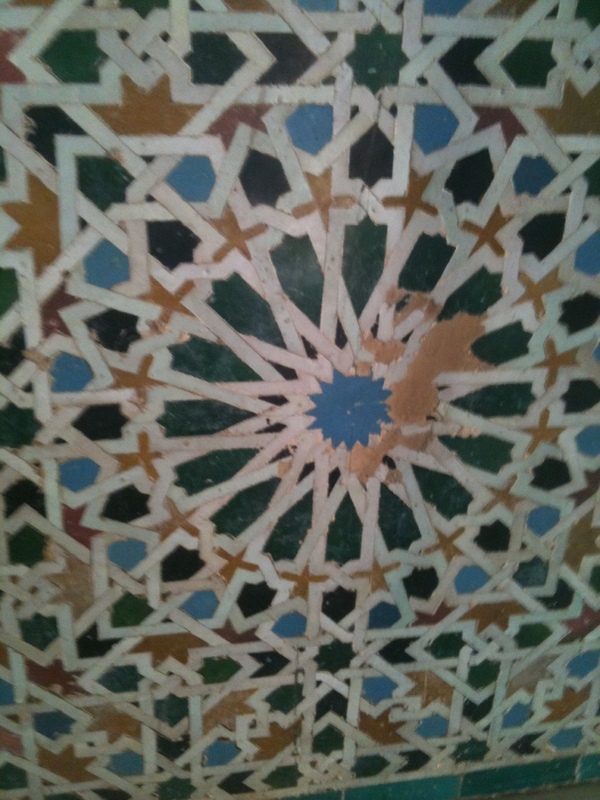 Extremely intricate wall tiles from the Alhambra. Probably from the 14th century. Table heater: Because of the lack of central heating, they use very long table cloths and then have a heater underneath the table. The table cloth then doubles as a blanket and holds in the precious heat. It is very cozy and efficient. Personal space: I’m so glad I warned them about this. For example, we were sitting on a beach looking at the med and a couple guys can up looking over the fence RIGHT next to us. People in the streets: My parents couldn’t stop commenting on how many people were in the streets, even when there weren’t processions to celebrate Holy Week. This is because Spaniards in general really to spend much more time outside their houses than normal Americans. Almost all social interactions occur outside the house. 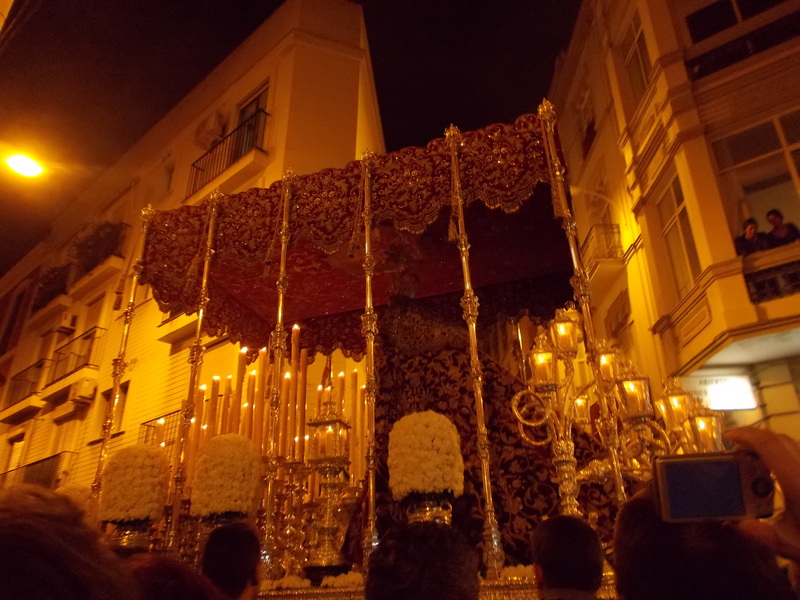 This is a close-up of a paso or a “float” of the religious processions that occur in Spain during Holy Week. Here is a similar paso out during the procession. 17 minutes – How late my class at University of Granada usually starts. Spain is quite relaxed with their sense of time, and it takes so much of the stress off. 106 people – The capacity of the normal sized bus in Granada that would probably hold 50 or 60 people in the US. Twice – The number of times I do my Michigan Nice smile to fellow pedestrians in the street each morning before I remember they think its weird. For Spaniards, it’s weird to look into strangers’s eyes, let alone smile. Well, hopefully the people who walk close to my house in the mornings just think I’m friendly! 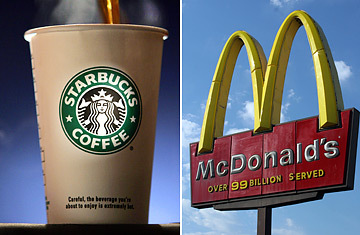 50% – The percent of Americans in roles Spanish singers imitate during a popular reality TV show. The influence of American shows and movies is everywhere! Almost everyone knows what Jersey Shore is, and the Simpsons (dubbed version) even has a prime time spot during lunch. Zero – The number of times that politicians are asked about their religious leanings. Here it is considered very taboo to ask religion when talking to a politician because that is considered more or less a violation of secular government and the separation of church and state. That is one of the reasons that some people consider the US government to be non-secular, a thought that would astound most US citizens. 3 pm – Normal lunch start time. Needless to say, I’m always hungry. Being in a host family is a very unique social situation. You are automatically living in very close quarters with people you barely know and at the beginning could barely communicate with. Luckily, it only took one mis-communication for my host mom and I to start learning how to understand each other. My host mom, a very traditional Catholic but a very welcoming and fun person, is named Ascención, but everyone calls her Choni. During the whirlwind first day, Choni had taught me how to make coffee on the stove using the small percolator she has. However, I didn’t fully understand how to turn it off. I thought, “its just a stove how hard can it be?” How wrong I was. My first day of class comes and, of course, I am running late. Everyone else in my host family had already left the house. I pour out my coffee and go to turn off the stove. After 5 minutes, I can get it to turn off except for one upside down four on one of the displays. After 10 minutes, I just had to leave. After class, I go running to the student life office to talk to one of the advisers and also a recent friend Estrella. I try to tell her in Spanish, but an emotional Evelyn attempting to explain in Spanish was just not going to cut it so I quickly switch to English. “I’m sure I’m going to burn the apartment down!” I exclaimed. She ensured me that everything would be alright and that she would give Choni a call. I went back to class and after lingering to talk to my new friends, heading back home for lunch. I was sure I would be greeted with a strict lecture when I arrived back home. However, I was greeted with an enthusiastic “Buenas dias, guapa!” (Hi, cutie) and a delicious. Later that day, she explained it once more and I realized that the upside down four was actually an h for hot. Since then, we’ve been getting along very well, including attending a kids club and church together and some very interesting discussions during lunch. I’m looking forward to getting to know her even better in the coming 3 months! 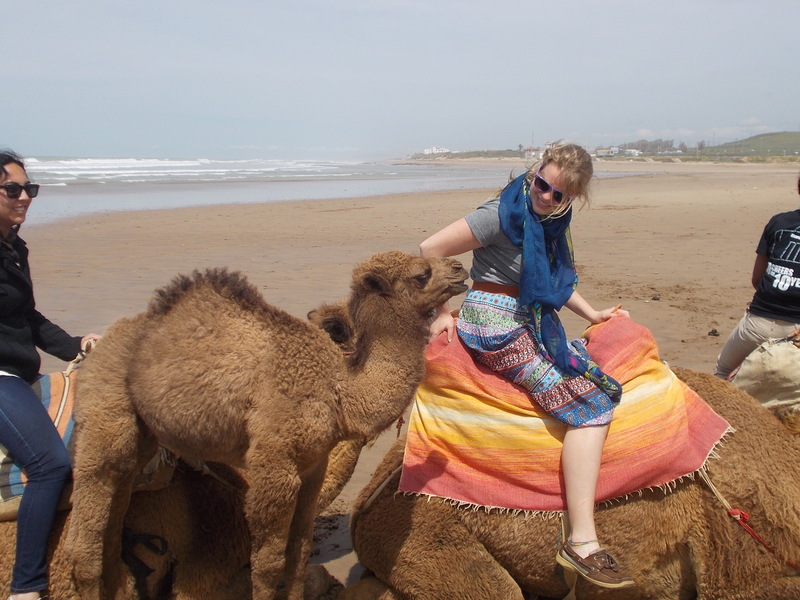 Posted on February 22, 2013 Author evelyn ritterCategories TravelTags Europe, SpainLeave a comment on Leaving for Spain! 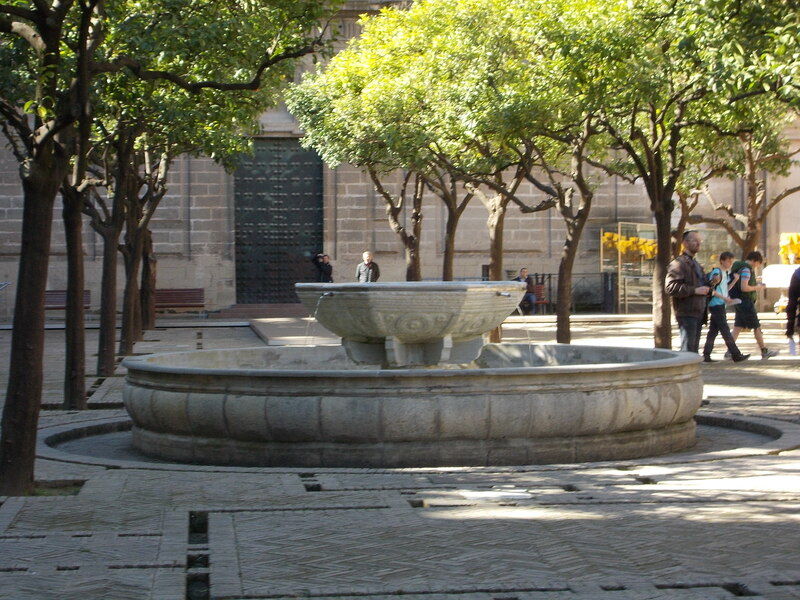 This is the fountain we saw in the center of the patio of the Cathedral in Seville. It looked like an average fountain, with children playing and old men chatting. However, as our professor explained more about the history of the this place, this fountain has been a part of a sacred meeting places for more than 1500 years. 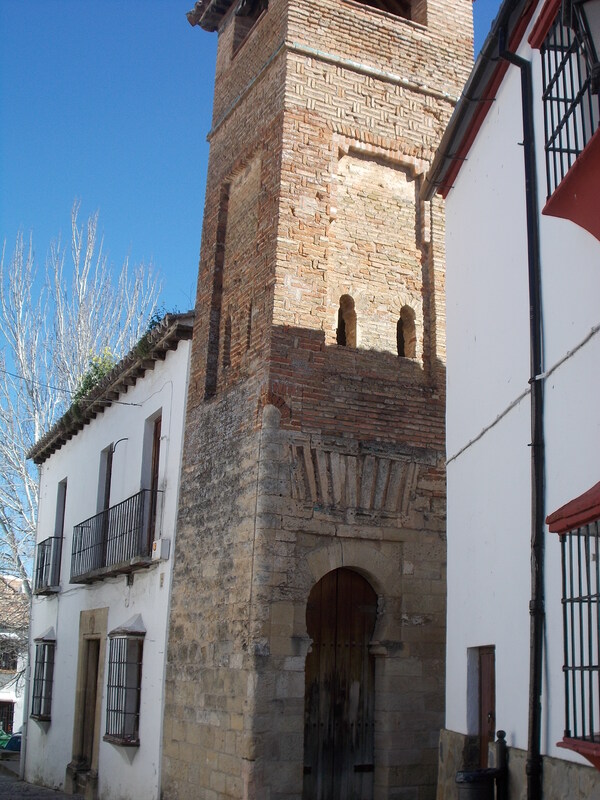 They have proof that this fountain was part of a Visigoth Church and after the place for the sacred washing before the Muslims would enter their church an now a fountain in the third largest Catholic cathedral in the world. Who would of thought that a simple fountain could have that much history! 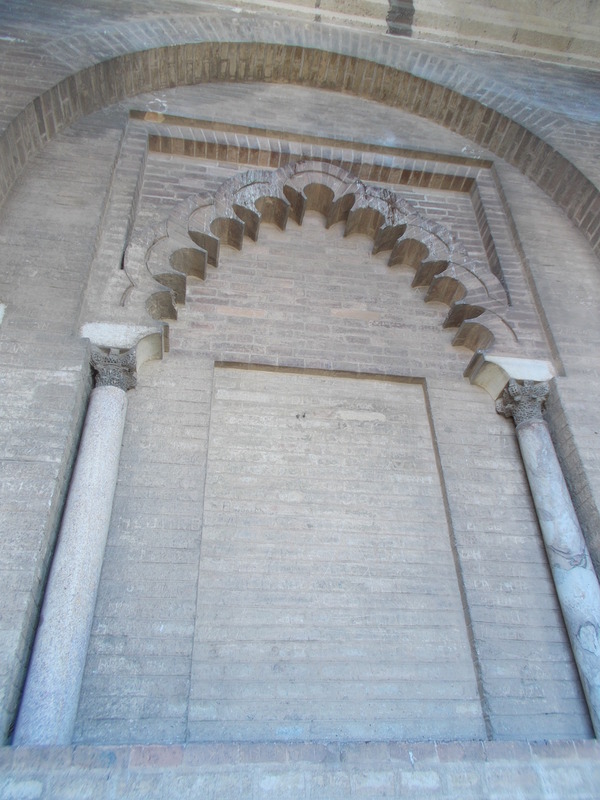 There were many other examples of the mix of Muslim and Christian history and architecture. The one on the right is a tower in Ronda. Where the Christians destroyed and the rebuild the tower can be seen where the rock at the bottom switches to brink halfway up. 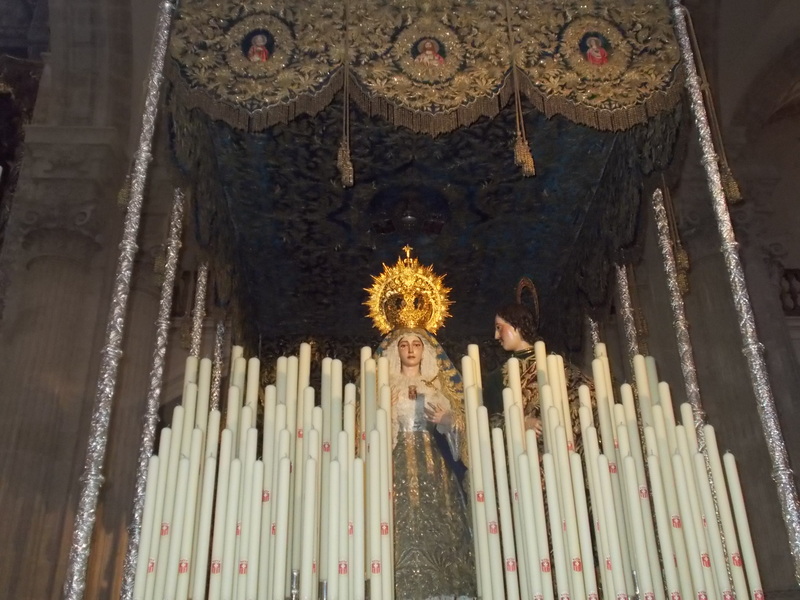 A similar event occurred at the mosque that used to be where the Seville cathedral is now. On the left you can see a picture of the inside of the top of the tower. After an earthquake destroyed the outer layer of the tower, the Christians rebuild the outside to house bells. The impressive arch can be seen dating from about the 13th or 14th century. As well columns visible are from the mosque at Cordoba to have continuity of the faith, so they date from about the 10th century! 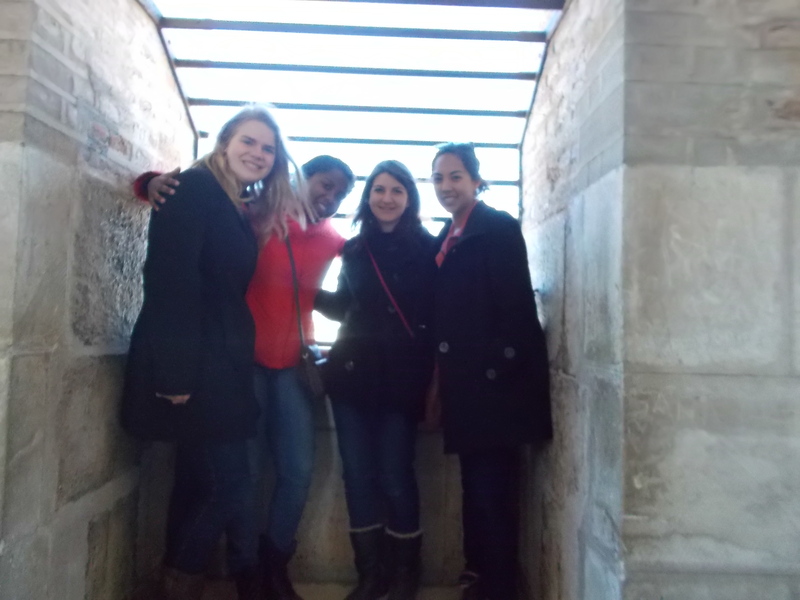 As cool as all the history, the best part of the trip was definitely getting to hangout with my new IES friends!